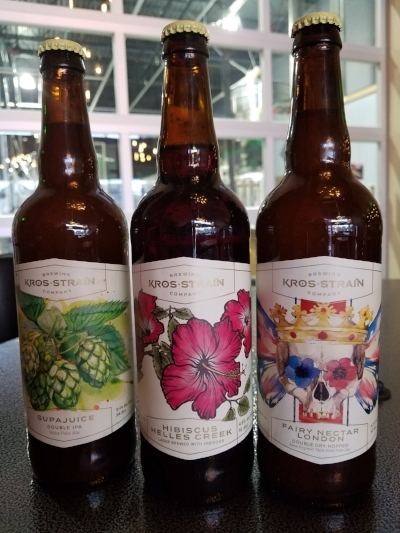 WHERE CAN I BUY KROS STRAIN BEERS? Six packs are available in our taproom. They are also available at most HyVee and grocery stores in Omaha, Lincoln, Grand Island and now Kearney. Beer and liquor stores also carry our beer including Beertopia in Omaha and Moran's Liquor in Lincoln. Kegs are available at Kros Strain Brewing. We also offer pony keg pumps for rent. To verify we have your preferred beer available in kegs, we ask you contact our salesman, Jeff. Once you reserve a keg for him, it will be ready for pick up in our taproom. Do you want to take a beer home with you that we currently do not offer in a six pack? Crowlers are the solution! Crowlers are 32oz cans of beer that is packaged in front of you in our taproom. First, the crowler is cleaned with reverse osmosis water, then purged with CO2, next the beer of your choice is put into the can, finally we professionally seam the lid onto the can with our crowler machine. Please call ahead for any orders of 3 or more crowlers. We will fill them the day you call and have them ready in our cooler for pick up. 750ML Bottles of our most popular beers available! Supajuice, Fairy Nectar London and Hibiscus Helles available in bottles to go! Variety of beers available for off sale purchases! Beers are bottled fresh in the brewery and sold directly from our cooler to your fridge! You can't get any fresher beers than these!